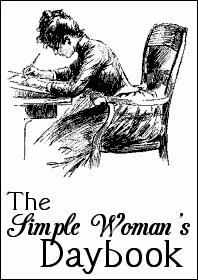 I always enjoy linking up with The Simple Woman and doing a Daybook. It seemed like a Daybook sort of day today. Hope you enjoy! Outside my window...it is appearing to be a beautiful, rather warm day and have you noticed, the sun is coming up and going down much earlier. I am thinking...that moving from this home of 33 years is going to be a super huge task! We will not be moving until sometime in the Spring but it overwhelms me just thinking about the process. But, little by little we will do it. I am thankful...for all the precious memories this home of 33 years holds for my family. This is the only house our children ever remember living in, so there's a lot of emotions that go along with this move. In the kitchen...I've been a busy gal in the kitchen the past 2-3 weeks. I've been doing what I call "bulk cooking." That's when I make dishes to put in the freezer. I've made Lasagna, Cheesy Chicken Casserole, Gumbo and Chili. I think I have 12 in all and I love having my "freezer stash." And, if I hear of a need, I can always go pull one of them out and share with someone. It's a "win win" situation! I am wearing......a Zenery outfit from Chicos. It's something I got off the sale rack last year and it's the perfect outfit for traveling. It's great fabric and super comfortable! I am going...to Texas this morning to see our daughter and family. We will celebrate Clancy's 6th birthday a little early ~his actual birthday is Oct. 2~ tomorrow afternoon. Can't believe our little cowboy is going to be 6 years old. I am wondering...how it can only be 90+ days until Christmas. My goodness, that's crazy! But, I did start my Christmas shopping this week and did I mention that I'm in love with Amazon Prime!! I literally ordered something this past Sunday afternoon and it arrived the next afternoon. That's what you call super service! I am reading...Losing Cooper, Finding Hope to Grieve Well by J.J. Jasper, morning host on the American Family Network. J.J. and Melanie Jasper share the story of losing their only son, 5 years ago, when he was involved in an accident on their family farm while with J.J. It is the most touching story of how J.J. and Melanie found hope in the midst of such a tragic accident. I highly recommend the book to anyone but especially someone that has lost a child tragically. I am hoping...that fall is just around the corner. We had a little taste of fall last weekend with temps in the 60's and it was so nice. But, it's been hot ever since. I'm thinking Mother Nature just likes to tease us a bit. I am looking forward to......to a fun 3 days in Las Vegas the end of the month. Hubby has a convention that we'll be attending. We have been to Vegas many times and we always enjoy going. It's a fun place to visit but heaven forbid that I should ever live there! Around the house...I'm looking at everything in a different light these days. While our new house is definitely not small, it is so totally different from this one. It is very open and we are losing quite a bit of room as a result. So, some of furnishings in this house will not get to make the move. So, I'm considering what I really, really want to make the move and all the while reminding myself that it's all "just stuff." I am pondering...the paint colors for the various rooms of our new house. Our decorator began suggesting colors this week and it's so exciting to me. Paint and fabrics are such fun! Of course, we are still a long way away from painting but at least we have plenty of time to work through some various ideas. And, there are sooo many choices when it comes to paint. I'm so glad that I have someone with "know how" to narrow down my choices. One of my favorite things......is internet shopping! I have gotten to where if I can get it online then I do. I had someone tell me the other day that they do their Wal-Mart shopping (except for perishables) online and it is delivered free to their house. I'm about to check that out as well. And, I love being able for my kids to email me links to gifts they and the Grans would like for Christmas and all I have to do it "click and buy." Talk about saving time!!! A few plans for the rest of the week......sharing a fun weekend with our Clancy man and his parents. Have I mentioned how absolutely wonderful it is to have them only 3 1/2 hours away!!!! A peek into my day...happily traveling down the road with Hubby towards Mt. Pleasant, Texas. Couldn't you just reach and touch that sweet face? 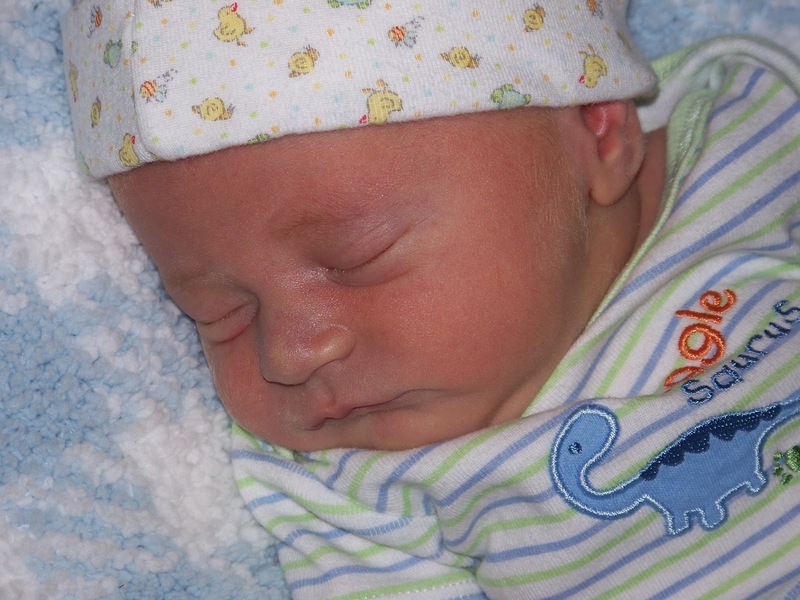 This is our little Clancy man when he was 5 days old. Now we're about to celebrate his 6th birthday. They do grow up so quickly! Wishing you a wonderful weekend like the one I'm about to enjoy! So happy that you and T will be with family this weekend. We will get home next week in time to turn around and go to Dallas for Grandparent's Day for AG. So grateful we can still do that. A day will come when we can't. Enjoy! Safe travels, dear Lea... What a beautiful grandbaby! Sounds like you like to shop the same way that I do ... online! ;-) We downsized when we moved here, and went from a house built in 1950 to an brand new house with an open floor plan. While I love the open floor plan, I miss having wall space for decorating. In every single room, we have just one expanse of wall (what with lots of windows and closets, etc. ), and with furniture, etc., the wall decor space is very limited.